Gholamzadeh, R., Eskandari, M., Mostafavi, H., Bigdeli, M. (2016). A Review on the Pretreatment Effect of EPO on Ischemic Tolerance in Different Tissues with an Approach to the Tissue Protection Mechanisms. 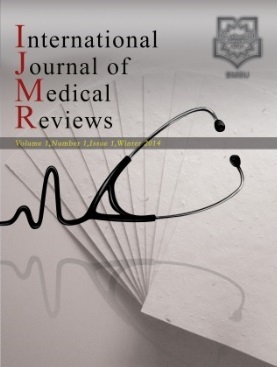 International Journal of Medical Reviews, 3(1), 389-400. Raheleh Gholamzadeh; Mehdi Eskandari; Hossein Mostafavi; Mohammad Reza Bigdeli. "A Review on the Pretreatment Effect of EPO on Ischemic Tolerance in Different Tissues with an Approach to the Tissue Protection Mechanisms". International Journal of Medical Reviews, 3, 1, 2016, 389-400. Gholamzadeh, R., Eskandari, M., Mostafavi, H., Bigdeli, M. (2016). 'A Review on the Pretreatment Effect of EPO on Ischemic Tolerance in Different Tissues with an Approach to the Tissue Protection Mechanisms', International Journal of Medical Reviews, 3(1), pp. 389-400. Gholamzadeh, R., Eskandari, M., Mostafavi, H., Bigdeli, M. A Review on the Pretreatment Effect of EPO on Ischemic Tolerance in Different Tissues with an Approach to the Tissue Protection Mechanisms. International Journal of Medical Reviews, 2016; 3(1): 389-400. Introduction: Ischemia due to oxygen and nutrient deficit, as well as waste producing causes tissue damage or organ dysfunction. Ischemia can be achieved in various tissues during surgery, organ transplantation, and use of certain drugs, sickle cell anemia, congestive heart disease, stroke and other motives. Also reperfusion of ischemic tissue can cause more serious damage. Recently, research strategies have been concentrated on the preconditioning mechanisms, such as pharmacological preconditioning which is used to increase tolerance to ischemia. Erythropoietin has antioxidant and anti-inflammatory properties and can be effective in reducing the damage caused by ischemia. Methods: In this paper, a review was performed on erythropoietin role in reducing the tissue damage related to ischemia in brain, heart, kidney, intestine, liver and lung. The review was done between 2003 up 2016 years in regard to preconditioning mechanisms and protective signaling pathway in tissues. dose and time of drug administration, and it appears that the greatest protective effect is related to its antioxidant property. Conclusion: According to the studies, there is a hope that the drug could be used in the future as a preventive agent of ischemia, in ischemia-threatening conditions, especially during the surgeries. However, investigation of probable side effects of the drug use is mandatory for its final approval. Ravi, Vivek Prakash, Ram Singh. A Study of Cardiovascular Diseases: Types and Risk Factor. JSIR Journal. 2013;2 (2): 433-459. Solaroglu I, Solaroglu A, Kaptanoglu E, etal. Erythropoietin prevents ischemia-reperfusion from inducing oxidative damage in fetal rat brain. Childs Nerv Syst. 2003; 19:19–22. Asheghabadi M, Bigdeli MR. The role of oxygen radicals-scavenger in neuroprotection-induced by normobaric hyperoxia on infarct volume in the rat brain. MJMS: Pathobiology.2012; 14 (2): 75-82. Pachori AS, Melo GL, Hart ML, etal. Hypoxia-regulated therapeutic gene as a preemptive treatment strategy against ischemia/reperfusion tissue injury. PNAS. 2004; 101(33) :12282-287. Eltzschig HK, Collard CD. Vascular ischemia and reperfusion injury. Brit Med Bull. 2004;70 (1): 71-86. Bigdeli MR, Mohagheghi F. The Pathophysiology of Brain Ischemia and Ischemic Preconditioning. Zahedan J of Res in Med Sci. 2014; 16(2): 1-5. Bigdeli MR. The Thereshold Assessment of Ischemic Tolerance Induced By Normobaric Hyperoxia in Rat Stroke Model. Shaheed Beheshti J of Res in Med. 2008 ; 32(2):95-103. Mohammadi. E, Bigdeli. M. R. Effectes of Preconditioning with Normobaric Hyperoxia on NA+/CA2+ Exchanger in The Rat Brain. Neuroscience. 2013; (237): 277–284. Alavian F, Hajizadeh S, Bigdeli MR, Javan MR. The Role of Proteinkinase C in Ishemic Tolerance Induced By Hyperoxia in Rats With Stroke. EXCLI Journal. 2012; 11: 188-197. Bigdeli MR, Asheghabadi M, Khalili A. The Course of Neuroprotection Induced By Normobaric Hyperoxia in Focal Cerebral Ischemia.2012;34(5):439-446. Sayan H, Ozacmak VH, Sen F, et al. Pharmacological preconditioning with erythropoietin reduces ischemia–reperfusion injury in the small intestine of rats. Life Sci. 2009; 84: 364–371. Byts N, Siren A-L. Erythropoietin: a multimodel neuroprotective agent. Exp Transl Stroke Med. 2009 ;1:4: 1-10. Alnaeeli M, Wang L, Piknova B, Rogers H, Li X, Noguchi CT. Erythropoietin in brain development and beyond. Anat Res Int J. 2012;p: 1-15. Pascho N, Lykissas MG, and E.Beris A. The Role of Erythropoietin as an Inhibitor of Tissue Ischemia. Int J Biol Sci. 2008 ; 4(3): 161-168. Solling Ch. Organe- Protective and Immunomodulatory Effects of Erythropoietin-An Update on Recent Clinical Trials. Basic Clin Pharmacol Toxicol J. 2011; 110: 113-121. Shen Y, Wang Y, Li D, et al. Recombinant Human Erythropoietin Pretreatment Attenuates Heart Ischemia-Reperfusion Injury in Rats by Suppressing the Systemic Inflammatory Response. Transplant Proc. 2010; 42: 1595–97. Xu B, Dong G-H, Liu H , Wang Y-Q, Wu H-w and Jing H. Recombinant Human Erythropoietin Pretreatment Attenuates Myocardial Infarct Size: A Possible Mechanism Involves Heat Shock Protein 70 and Attenuation of Nuclear Factor-kappaB. Spring. 2005;35(2):161-8. Lipšic E, van der Meer P, Henning R.H, et al. Timing of Erythropoietin Treatment for Cardioprotection in Ischemia/Reperfusion. J Cardiovasc Pharmacol. 2004; 44( 4), p:473-79. Rong R, Xijun X. Erythropoietin pretreatment suppresses inflammation by activating the PI3K/Akt signaling pathway in myocardial ischemia-reperfusion injury. Exp Ther Med. 2015;10(2):413-8. Givehchian M, Beschorner R, Ehmann C, et al. Neuroprotective effects of erythropoietin during deep hypothermic circulatory arrest. Eur J Cardiothoracic Surg. 2010; 37: 662-68. Li Y, Lu Z-Y, Ogle M, Wei L. Erythropoietin Prevents Blood Brain Barrier Damage Induced by Focal Cerebral Ischemia in Mice. Neurochem Res. 2007; 32:2132–41. Liu K, Sun T, Wang P, Liu Y-H, Zhang L-w, Xue Y-x. Effect of Erythropoietin on Blood-Brain Barrier Tight Junctions in Ischemic-Reperfusion Rats. J Mol Neurosci. 2013; 49: 369-379. Yu D, Fan Y, Sun X, Yao L, Chai W. Effects of erythropoietin preconditioning on rat cerebral ischemia‑reperfusion injury and the GLT‑1/GLAST pathway. Exp Ther Med. 2016;11(2):513-8. Mateˇjkova S, Scheuerle A, Wagner F,et al. Carbamylated erythropoietin-FC fusion protein and recombinant human erythropoietin during porcine kidney ischemia/reperfusion injury. Intensive Care Med. 2013; 39: 497–510. Lin X, Jiang C, Luo Z, Qu S. Protective effect of Erythropoietin on renal injury induced in rats by four weeks of exhaustive exercise. BMC Nephrology. 2013; 14:130, 2-8. Mohamed HE, El-Swefy SE, Mohamed RH, Ghanim AMH. Effect of erythropoietin therapy on the progression of cisplatin induced renalinjury in rats. Experiment Toxicol Pathol. 2013; 65: 197–203. Hu L, Yang C, Zhao T, et al. Erythropoietin Ameliorates Renal Ischemia and Reperfusion Injury via Inhibiting Tubulointerstitial Inflammation. J of Surg Res. 2012; 176: 260–66. Kiris I, Kapan S, Kılbas A, et al. The Protective Effect of Erythropoietin on Renal Injury Induced by Abdominal Aortic-Ischemia-Reperfusion in Rats. J of Surg Res. 2008; 149: 206–213. Zou Y-R, Zhang J, Wang J, Peng L, Li G-S, Wang L, editors. Erythropoietin Receptor Activation Protects the Kidney From Ischemia/Reperfusion-Induced Apoptosis by Activating ERK/p53 Signal Pathway. Transplant Proc; 2016: DOI: 10.3892/etm.2015.2919 . Hashemzadeh S, Hashemzadeh K, Somi MH, et al. Does Erythropoietin Protect the Intestine against Ischemic/Reperfusion Injury in Rabbits?. Life Sci J. 2012; 9(4): 4791-95. Bayomy NA, Salah W. Protective Effect of Erythropoietin on Histological, Immunohistochemical and Biochemical Changes of Ileal Mucosa Induced by Intestinal Ischemia/Reperfusion Injury in Adult Albino Rat. Egypt J Histol. 2010; 33(2): 257 - 69. Guneli E, Cavdar Z, Islekel H, et al. Erythropoietin Protects the Intestine Against Ischemia/Reperfusion Injury in Rats. Mol Med. 2007; 13(9-10): 509-17. Kai-Lan W, Si Z, editors. Pretreatment With Erythropoietin Attenuates Intestinal Ischemia Reperfusion Injury by Further Promoting PI3K/Akt Signaling Activation. Transplant Proc. 2015; 47: 1639-45. Sepodes B, Maio R, Pinto R, et al. Recombinant human erythropoietin protects the liver from hepatic ischemia-reperfusion injury in the rat. Transpl Int. 2006; 19: 919–26. Yilmaz S, Ates E, Tokyol C, Pehlivan T, Erkasap S, Koken T. The protective effects of erythropoietin on ischemia/reperfusion injury of liver. HPB. 2004; 6(3): 169-73. Luo YH, Li ZD, Liu LX, Dong GH. Pretreatment with erythropoietin reduces hepatic ischemia-reperfusion injury. Hepatobiliary Pancreat Dis Int. 2009; 8(3): 294-99. Liu Q-S, Cheng Z-W, Xiong J-G, Cheng S, He X-F, Li X-C, editors. Erythropoietin pretreatment exerts anti-inflammatory effects in hepatic ischemia/reperfusion-injured rats via suppression of the TLR2/NF-κB pathway. Transplant Proc. 2015; 47:283-289. Wu H, Ren B, Zhu J, Dong G, Xu B, Wang C, et al. Pretreatment with recombined human erythropoietin attenuates ischemia–reperfusion-induced lung injury in rats. Eur J Cardiothorac Surg. 2006;29(6):902-7. Wu H, Dong G, Liu H, Xu B, Li D, Jing H. Erythropoietin attenuates ischemia–reperfusion induced lung injury by inhibiting tumor necrosis factor-α and matrix metalloproteinase-9 expression. Eur J Pharmacol. 2009;602(2):406-12. Bigdeli MR, Rahnema M, Khoshbaten A. Preconditioning With Sublethal Ishemia or intermittent normobaric hyperoxia up- regulates glutamate transporters and tumor necrosis factor- alfa converting enzyme in the rat brain. J Stroke Cerebrovasc Dis. 2009; 18(5): 336-42. Bigdeli MR, Rasoulian B, Meratan AA. In vivo normobaric hyperoxia preconditioning induces different degreses of antioxidant enzymes activation in rat brain tissue. Eur J Phamacol. 2009; 611(1-3): 22-29. Bigdeli MR, Asheghabadi A. Effect of intermittent normobaric hyperoxia on blood brain barrier in a rat model of stroke. JQUMS J. 2013; 16(4): 4-11. Bigdeli MR, Mostafavi H, Gholamzadeh R, Eskandari M. Pretreatment Effect of Erythropoietin on Brain Tissue Water Content after Brain Ischemia Induction by Middle Cerebral Artery Occlusion (MCAO) in MaleWistar Rats. J Zanjan Univ Med Sci. 2016; 104:59-72 (in persian).